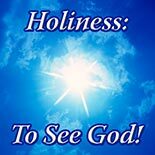 Holiness is a pivotal issue and has to do with the present life AND the future life. Holiness is one of the essential teachings in the Scriptures. There is a process of being made Holy, which starts with humility, being broken and having a contrite heart.